Whoever took that picture ought to be shot. The lighting is dreadful. Re: Thornton House Photos and Band,school teams etc. I'm sure if you sent them to our Illustrious leader, young Julian, he'd oblige for you. He has down-loaded my pictures in the past. Here's Thornton A, 1997. Mr O'Boyle, housemaster, is third row fifth from left. 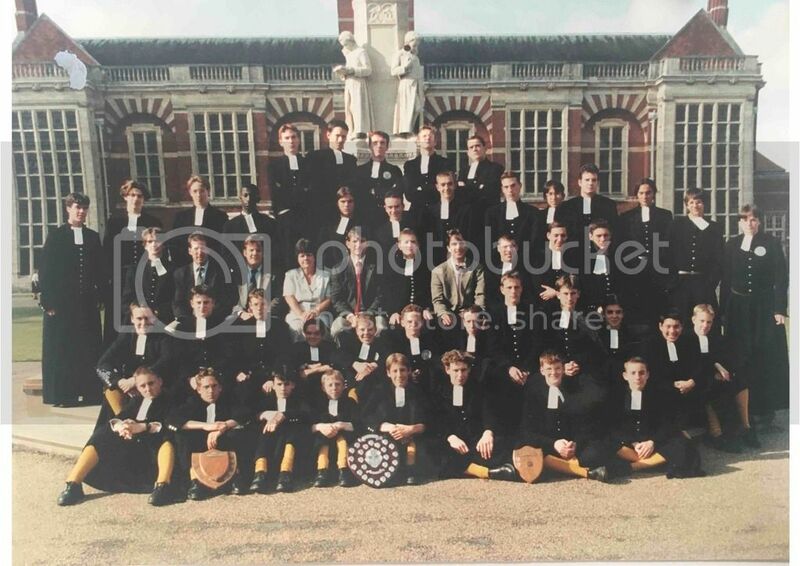 House captain Nick Wolstenholme in the center and Mr Phelps / Philps (?) the other side. I can't remember how to spell his last name but do remember he taught maths and could juggle. I forget the name of the CDT teacher next to Matron (I forget Matron's name too), but he was a laugh and Mr Marlow is next to him. I'm on the far left. Oh, the memories. I don't know why were on the quad for the picture, rather than outside the house though. can you post that pic again pls...? Mr Williams sounds right. Andy Williams? Not matron Moody though. She retired a year or two before (94 or 95 I think).